Sonnet's Breakaway Puck offers portable eGPU for Thunderbolt 3 enabled computers in an incredibly small and lightweight unit. Gaming or graphics processing on a thin/light notebook? Even when equipped with a beautiful display and a high-performance CPU, you probably wouldn’t have thought of loading games onto one (unless you like playing at low frame rates, resolutions, and detail settings). 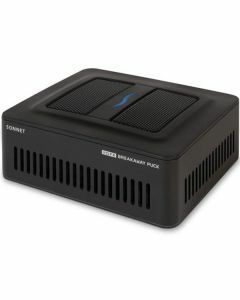 With the development of Thunderbolt 3 connected external GPUs, such as Sonnet’s eGFX Breakaway Box, desktop boxes that support a range of desktop GPU cards that can boost your computer’s graphics performance are now available, making Ultrabook gaming and video editing a reality. But, they are, at best, transportable. What if you could instantly boost your computer’s graphics performance anytime and anywhere you need it, without being anchored to a desk? Here’s an idea—Pack a Puck! Sonnet’s eGFX Breakaway Puck is an extremely-portable, high-performance, all-in-one external GPU for Thunderbolt 3 computers that provides accelerated graphics and multi-display connectivity. With a Puck connected to your computer, you can dramatically accelerate popular graphics-intensive games and pro applications anywhere. The eGFX Breakaway Puck conveniently packs with your notebook in a backpack or computer bag when you need GPU acceleration while on the road. Connected to your computer with a single 0.5-meter Thunderbolt 3 (40Gbps) cable (included), the Puck provides 45W of Power Delivery, which means it will power and charge your computer while connected, even when not in use, allowing you to leave your computer’s power brick behind. Whether you’re looking for a ultra-convenient way to game with an ultrabook at a LAN party, or you’re a pro who needs an extra computational power boost for on-location rendering, color grading and video editing, the Puck injects extra GPU power to go. Measuring a compact 6 inches wide by 5.1 inches deep by 2 inches tall, the eGFX Breakaway Puck has a minimal footprint on the desktop, and is the right size to compliment your thin/light notebook. Using the optional VESA Mounting Bracket Kit, you can free up desk space and mount the eGFX Breakaway Puck to the back of a monitor with open VESA mounting holes (VESA 75 and VESA 100 hole patterns supported). The bracket is secured with provided hardware, and provides simple cable management. To further cut down on cable clutter, Sonnet includes a 0.5-meter DisplayPort cable in the kit to connect between the Puck and your display. The Mounting Bracket Kit also includes parts that enable it to be attached to virtually any multi-monitor stand on any shaped stand upright or monitor arm. When you choose an Ultrabook, you don’t get all the same capabilities as a desktop computer can offer, such as connecting multiple displays. But, of course, you wouldn’t want to carry a desktop computer in your backpack. Why choose between the ultimate in notebook portability and multi-display support? With its three DisplayPort ports and one HDMI port, the eGFX Breakaway Puck leverages AMD’s Eyefinity multi-display technology to support up to four 4K displays with its single Radeon GPU! With the Puck connected, there’s no need to compromise between the super-light notebook you want and the number of displays you need on your desktop. Thunderbolt 3 is a leap forward in every way. Whether you’re editing 4K video at high frame rates or blasting aliens out of the sky, you can now transform your notebook into a true desktop experience. With up to 2750 MB/s available bandwidth, the Breakaway Box exploits its 40Gbps Thunderbolt 3 interface to offer the best-possible eGPU experience, or handle the most demanding, highest performance PCIe cards. macOS High Sierra (10.13) currently offers only beta support for connection of external GPUs, and not all Thunderbolt Macs are currently supported with AMD beta GPU Thunderbolt drivers. For information regarding enabling the use of the eGFX Breakaway Puck with macOS, click here.